There have been some pretty big volcanic eruptions in human history. Consider the eruption at what is now Lake Toba in Sumatra, Indonesia just over 70,000 years ago. It was so huge that (it is believed that) perhaps only about 3,000 people survived in the whole world! It must have caused a volcanic winter lasting as long as ten years. Another famous eruption is that of Mount Vesuvius in Sicily, Italy. A little less than 2,000 years ago, it destroyed the Roman cities of Pompeii and Herculaneum. Stones and ash were thrown up to a height of over 30 kilometers and it caused the death of about 16,000 people. 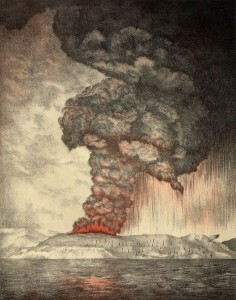 More recently, a huge volcanic explosion on the island of Krakatoa, between Sumatra and Java in Indonesia, caused a tsunami that killed about 36,000 people. 3,000 people were living on the island of Sebesi, about 13 kilometers away. No one survived.